I love Valentine's Day. I love that it is officially a holiday where homemade gifts for friends and family are welcome. I love homemade gifts that don't look "homemade." 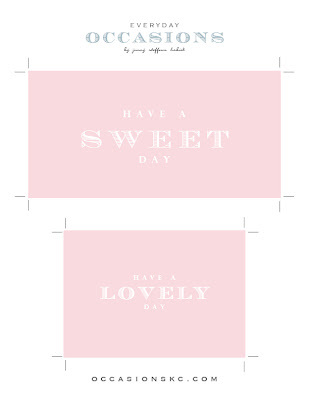 Create a homemade gift with a professional look with these Valentine's Day Cards & Labels templates you can print yourself. Download them here, to create your own goodies! Use the "Have a SWEET Day" label to create this cupcake gift. For step-by-step directions for making the cupcake gift box, click here. Wish your friends a "Lovely" Valentine's Day with this little grocery store bouquet of tulips. How am I just now finding your blog? Oh my beauty and creativity! I love using burlap for anything and often rewrap flowers in burlap when I gift them! Off to look around. So glad I stumbled here. This is so beautiful love your post and blog, learned about you from Kevin Sharkey's blog. Wish you great success. Your packaging ideas are fabulous! where can i get the brown boxes? you are amazing!!!! i can't stop reading EVERYTHING!!! i am visiting you everyday! i can't get enough of everything on your blog! !